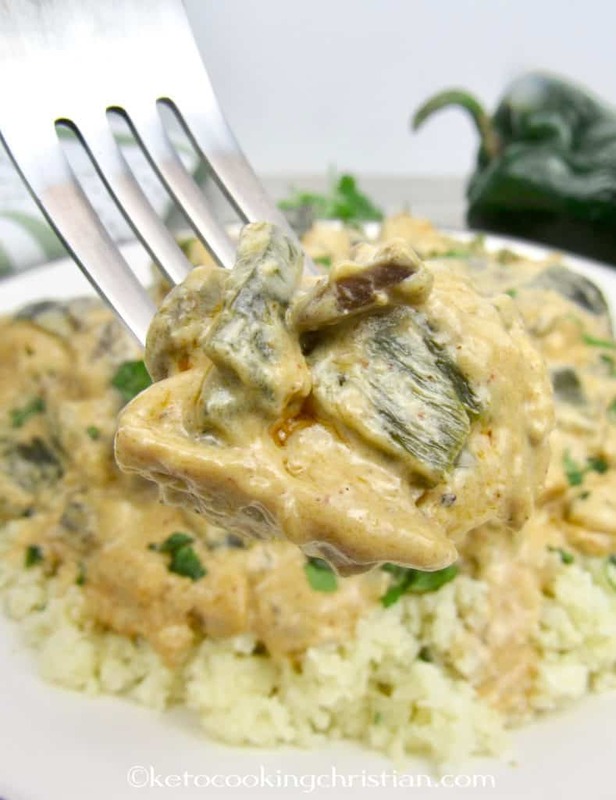 Chunks of chicken smothered in a creamy poblano pepper and mushroom sauce! 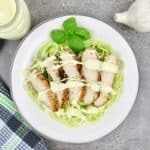 Dinner in under 30 minutes that is healthy and packed with flavor! 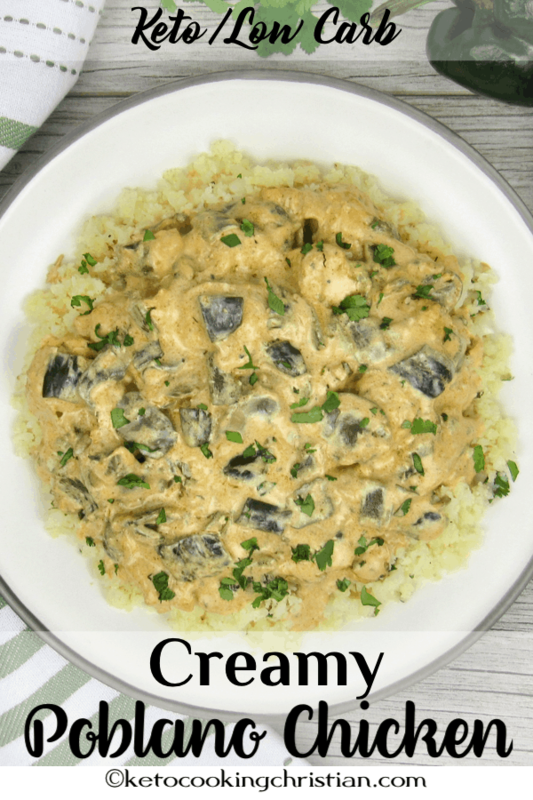 I roast a poblano pepper and add it to this wonderfully creamy sauce. 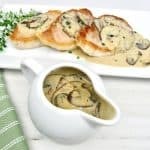 Baby bella mushrooms are also a nice addition and are loaded with potassium! 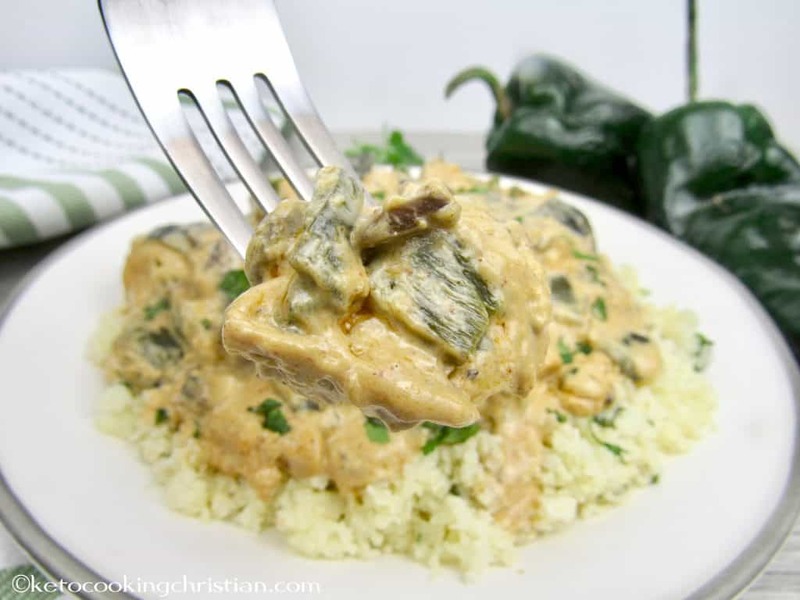 Smoked paprika reinforces that smoky flavor from the roast poblano pepper. 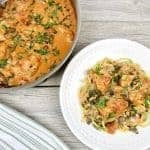 This Low Carb one pot dinner is super easy to make and promises to satisfy! 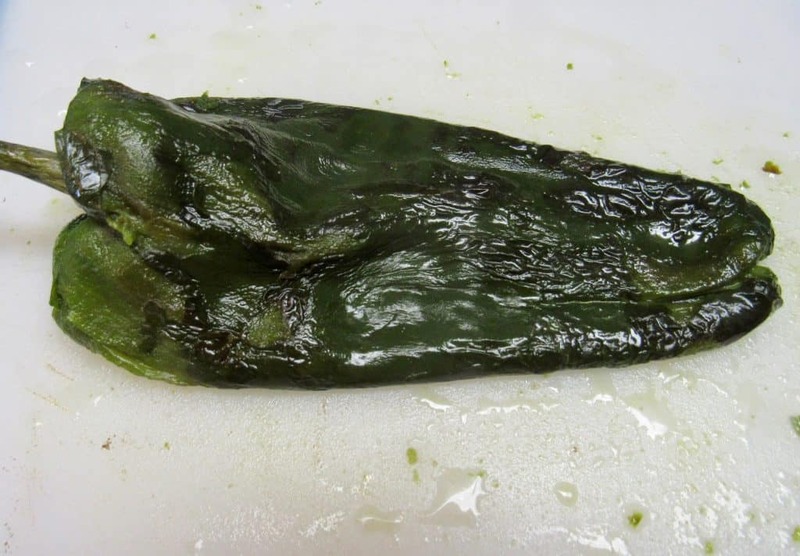 Brush the poblano peppers with olive oil and roast them in the oven for a 5-7 minutes, to char the skins. Alternatively, you can grill them instead. 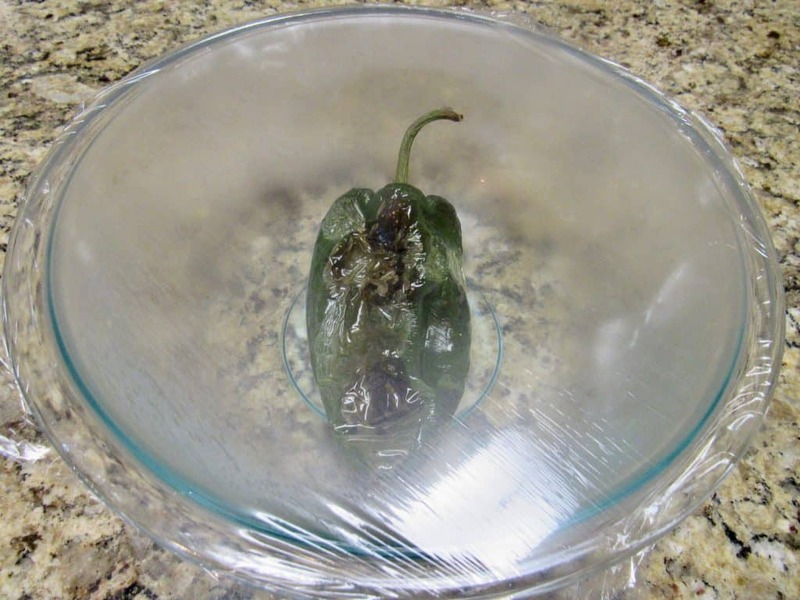 Remove and add to a bowl covered with plastic wrap (this will loosen the skin and make it much easier to peel). This is the same method I used when I made my Chorizo & Cauliflower Stuffed Poblano Peppers last year and it works perfectly! Set aside for a few minutes and allow the peppers to steam. 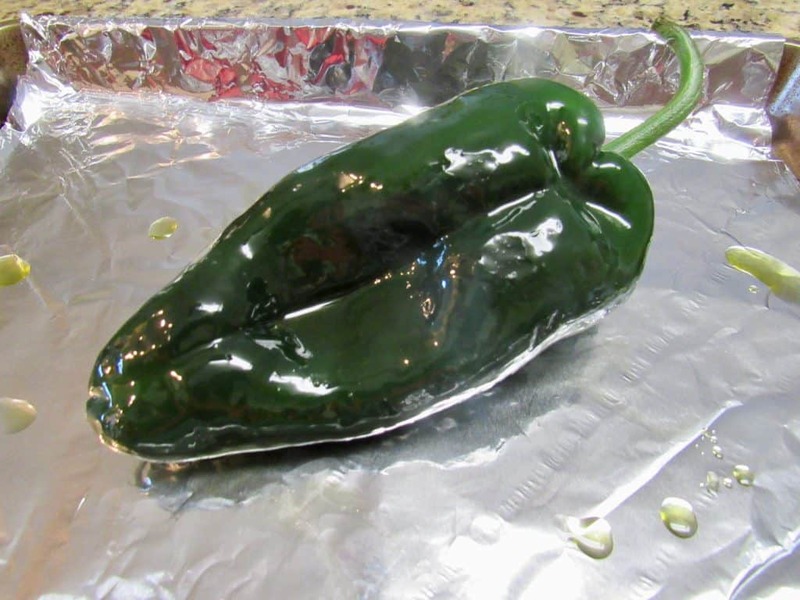 Then remove the plastic wrap from the bowl, gently scrape off the skin of the poblano, and dice. 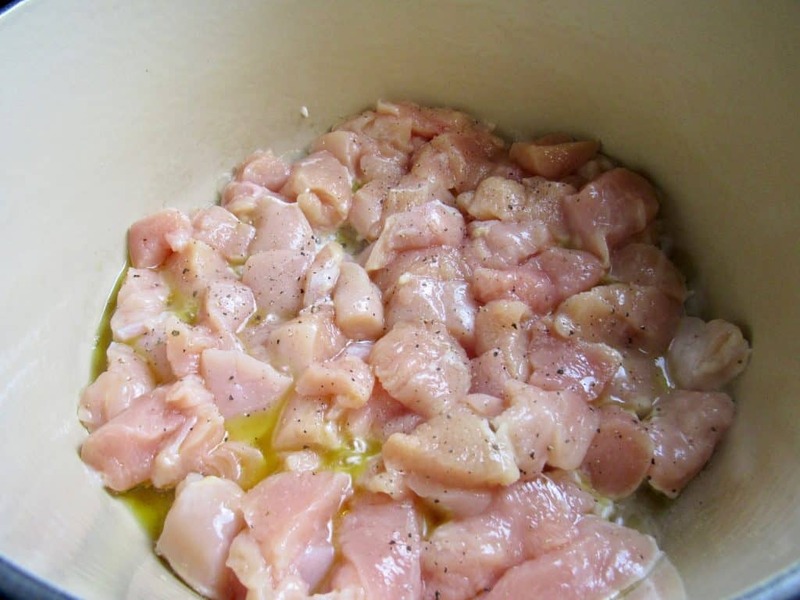 Heat a skillet to medium and add in the olive oil, chicken, salt and pepper, then sear for a few minutes, remove and set aside. 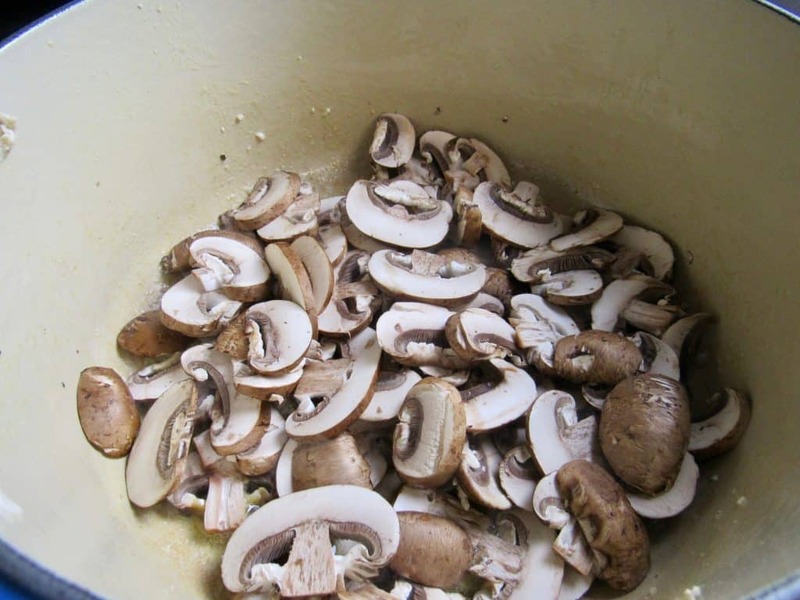 Add in the butter and sauté the mushrooms and get some good color on them. Remove and set aside, then add in the garlic and sauté for about 20 seconds, careful not to burn it. Toast the smoked paprika for 10 seconds, then deglaze the pan with the white wine, scraping up the little brown bits of flavor. 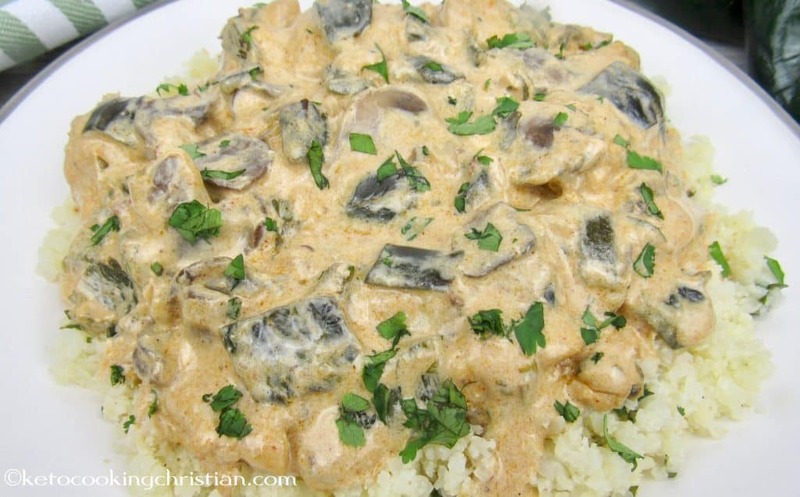 Stir in the cream cheese and heavy cream. 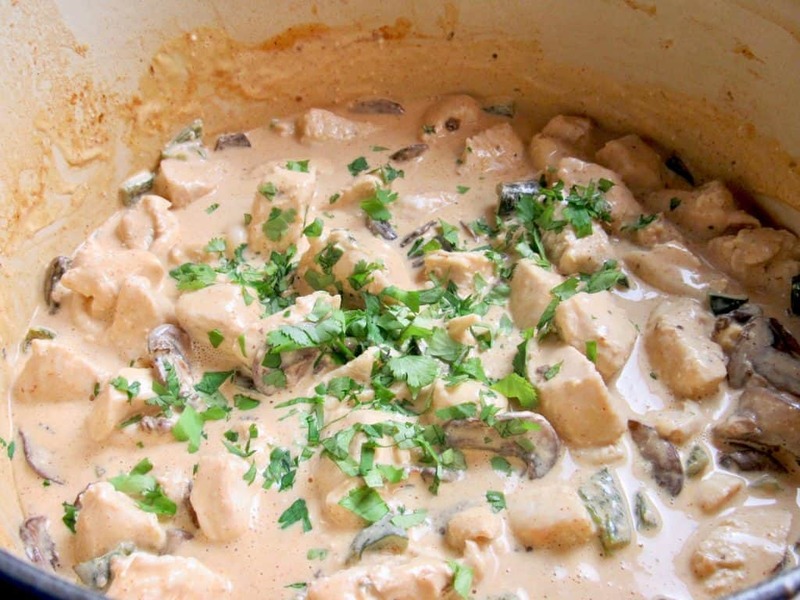 Once melted, add back in the chicken, mushrooms, cilantro, chicken stock and poblano peppers. 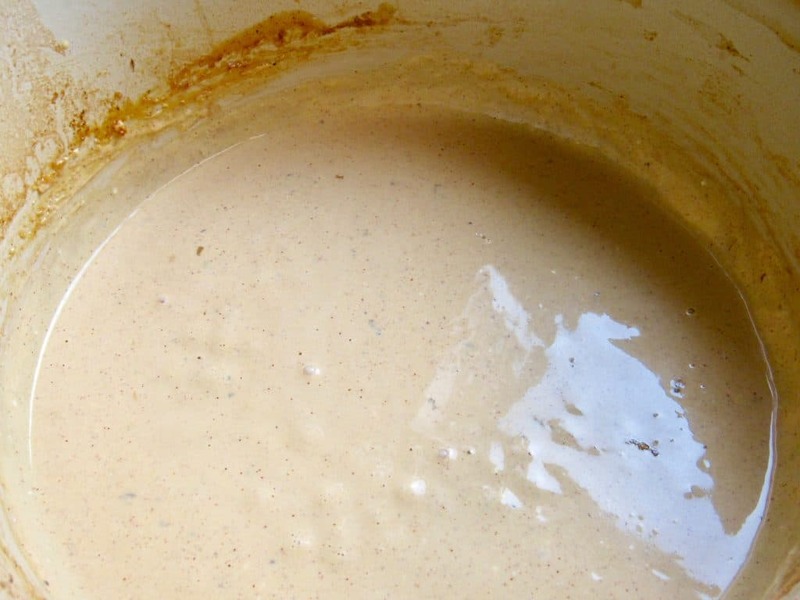 Simmer on low, covered for 8-10 minutes or until thickened nicely and the chicken is cooked through. 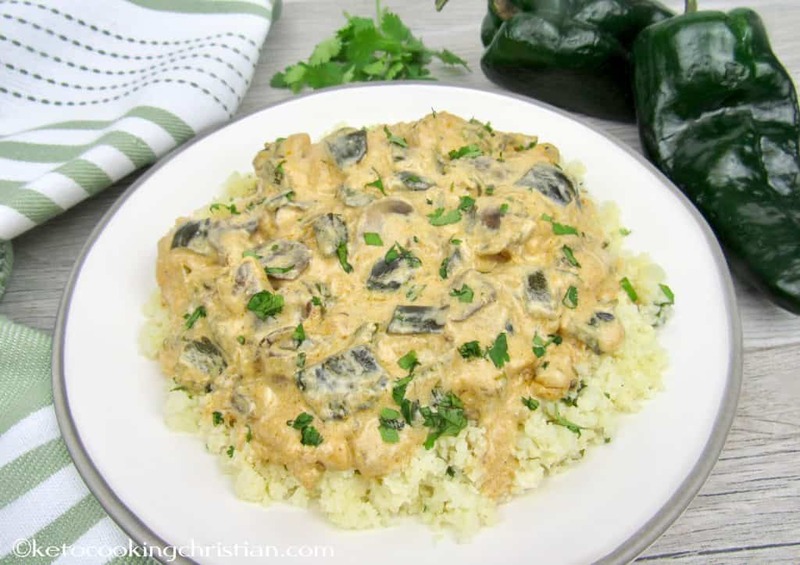 Serve over cauliflower rice or zucchini noodles, garnish with fresh cilantro and enjoy! Preheat oven to 400F. 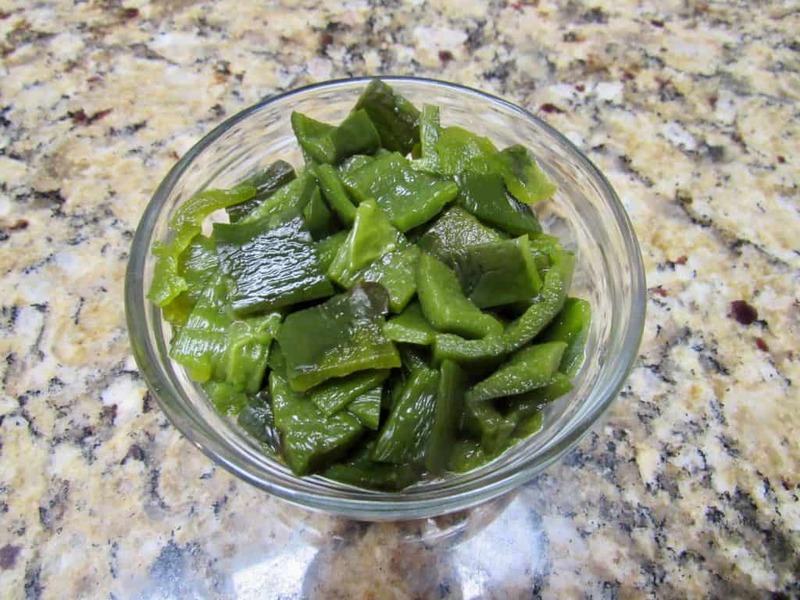 Brush the poblano peppers with olive oil and roast them in the oven for a 5-7 minutes, to char the skins. Alternatively, you can grill them instead. Remove and add to a bowl covered with plastic wrap (this will loosen the skin and make it much easier to peel). 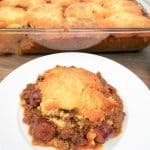 This is the same method I used when I made my Chorizo & Cauliflower Stuffed Poblano Peppers last year and it works perfectly! Heat a skillet to medium and add in the olive oil, chicken, salt and pepper, then sear for a few minutes, remove and set aside. 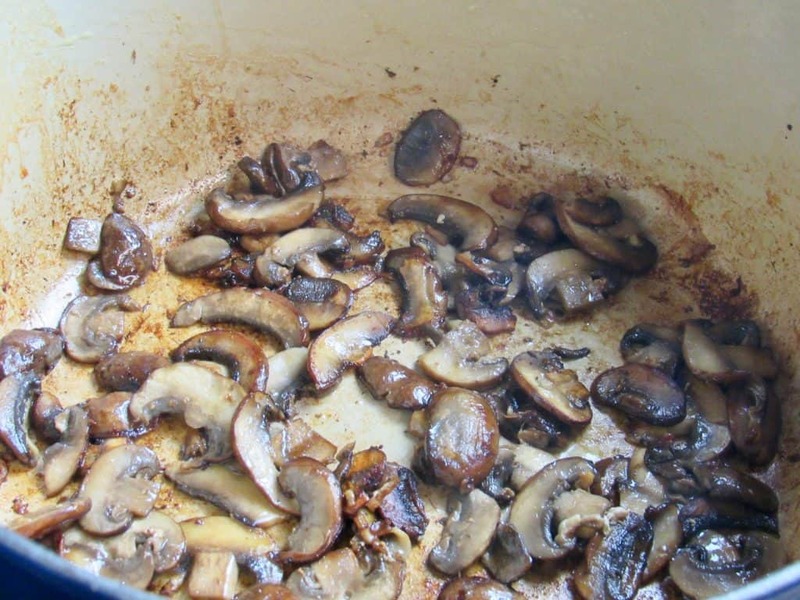 Add in the butter and sauté the mushrooms and get some good color on them. Remove and set aside, then add in the garlic and sauté for about 20 seconds, careful not to burn it. 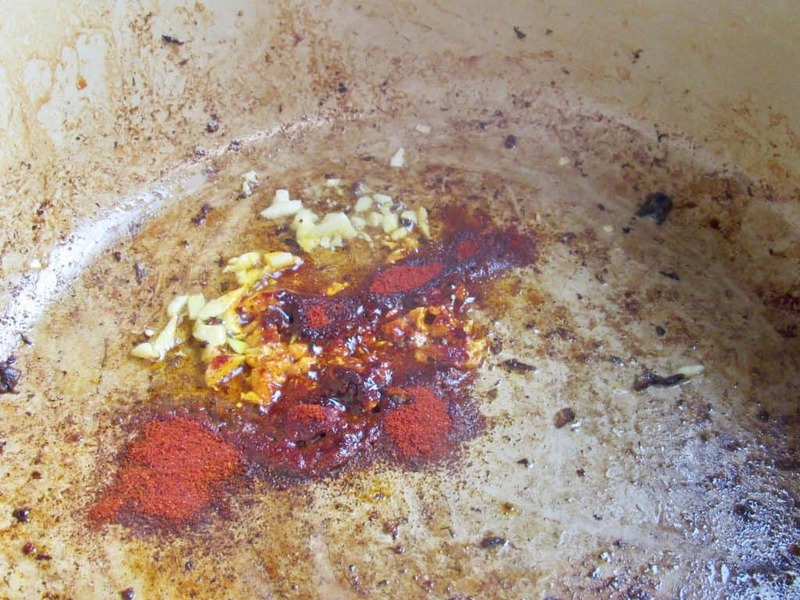 Toast the smoked paprika for 10 seconds, then deglaze the pan with the white wine, scraping up the little brown bits of flavor. 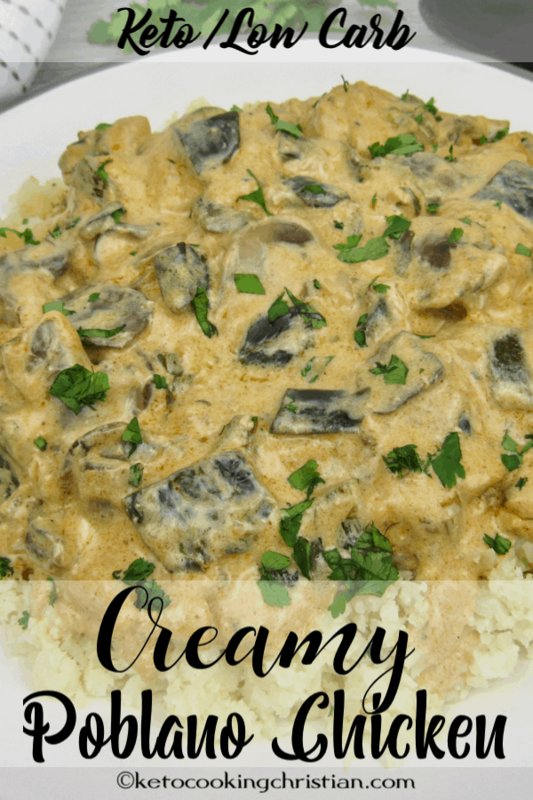 Stir in the cream cheese and heavy cream. 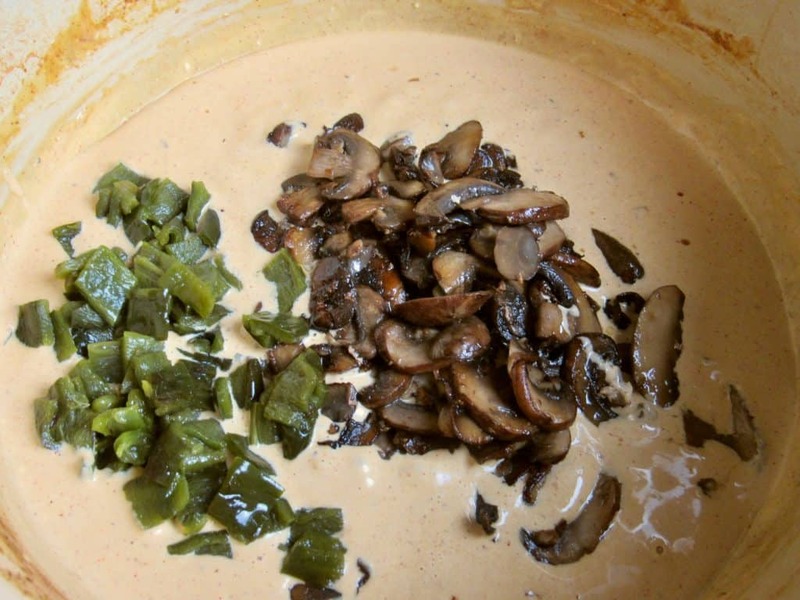 Once melted, add back in the chicken, mushrooms, cilantro, chicken stock and poblano peppers. 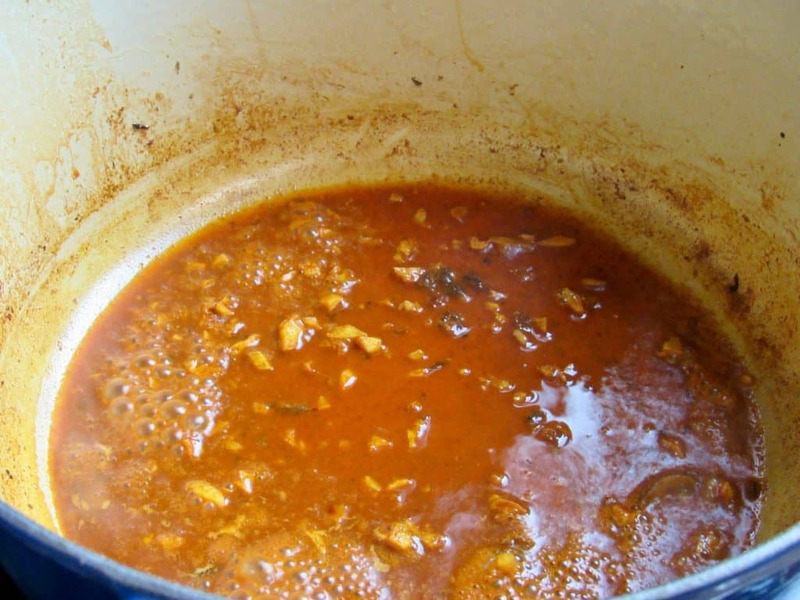 Simmer on low, covered for 8-10 minutes or until thickened nicely and the chicken is cooked through. 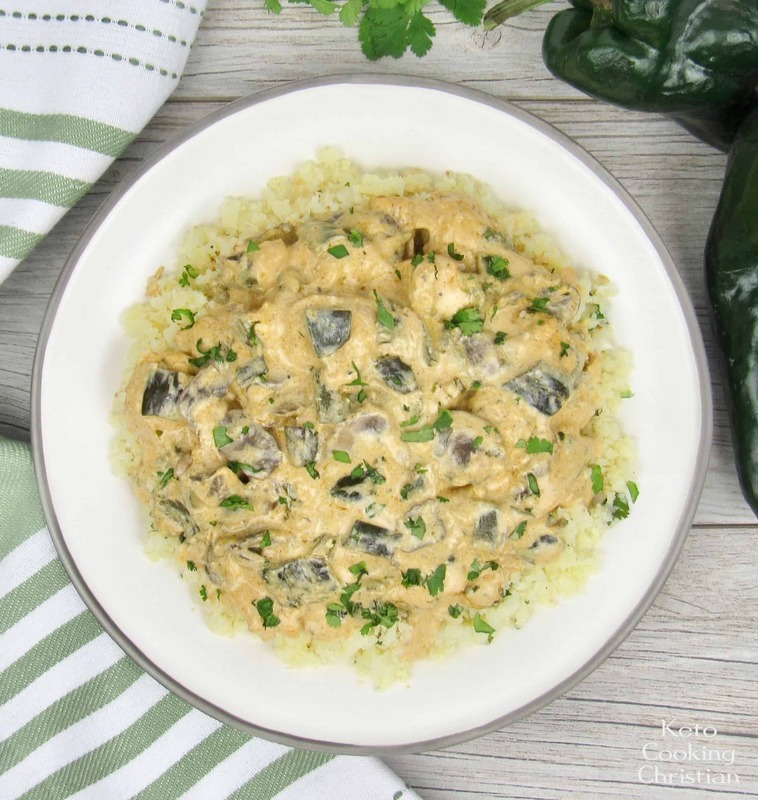 Serve over cauliflower rice or zucchini noodles, garnish with fresh cilantro and enjoy! Store leftovers in the fridge for a few days or freeze. **Macros do not include cauliflower rice, so be sure to adjust them according to what you decide to serve the chicken with.